At least 300 people, including many schoolchildren, have been injured when two passenger trains collided near the South African capital, Pretoria, officials say. Medical workers say 28 people were seriously hurt. The theft of cables used for signalling, compounded by human error, caused the crash, said the head of South Africa's rail authority. South Africa is in the process of overhauling of its ageing rail network. "Both of the trains were full of commuters and between them were lots of schoolchildren on the way to school," a spokesman for the regional emergency services told the AFP news agency. A helicopter has airlifted one of the train drivers to a nearby hospital after he was trapped in the wreckage for two hours. A spokesman for the local emergency services told the BBC it had transported more than 200 people, three of whom were critical, while 19 had serious injuries. The private Netcare 911 service said it had assisted 100 people, with three critical and three more seriously injured. The injured have all been taken to hospitals in Pretoria and Johannesburg. "When cables are stolen it affects our signalling system," said rail authority head Mosenngwa Mofi. "We then move to what we call manual operations." 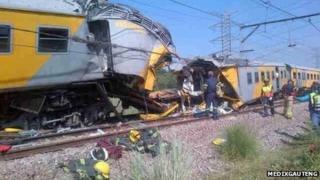 In 2011, at least 800 people were injured when a speeding train hit a stationary one near the township of Soweto.